So, this is the other Jack of Fables. After saving all of existence, Jack Horner has entered a kind of retirement. But his son, Jack Frost, is still wandering around the Fable worlds, trying to make a name for himself as a hero. This is a disconnected-from-everything-else book about that. The Fulminate Blade is a literal thing, a kind of lightning sword that is the only thing that might kill a giant in the sky who stands accused of stealing gold and virgins from the kingdom below. You know that time (not pictured in any particular Fables book, but well known I think within the fables themselves) when Jack Horner climbed a beanstalk and fought a giant over an egg-laying goose with a chemical imbalance? This is like that, but a) science-fictional more or less? Amazon says it’s the far distant future of the world of Buck Rogers and Flash Gordon. That may be true? I can find no evidence of it in the text, but as guesses go: sure, it could be. Why not? …and b) with a lot more intrigue, from every direction. Unrelated to any of this even moreso than any of this is unrelated to the rest of the Fables storylines: I’m pretty much done with Walter Mitty the miniature Blue Ox. Even one page per issue is two pages too many. Luckily, the Jack of Fables spinoff series is wrapping up soon! 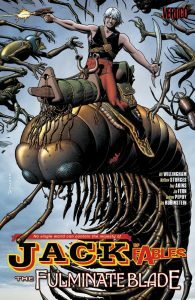 This entry was posted in Words and tagged fantasy, graphic novel on February 17, 2017 by Chris. 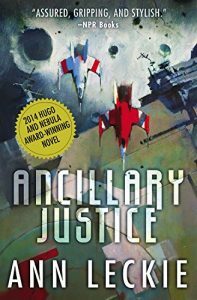 Rumor has it, Ancillary Justice won a lot of awards when it came out a few years ago. This is fair enough, because it ties a well-written take on an intriguing sfnal concept (that would be a spoiler for the early book to reveal, see footnote  below cut) to a good story that, to nobody’s surprise who has read the title, is deeply concerned with justice on both personal and imperial scales, and it wraps that package up in meaningful social commentary on the topic of gender and identity. I should probably read the other two? I’m not sure how much they will further address cool sfnal concepts and meaningful social commentary, but like I said: the story was good too. Problematically, I own neither. This entry was posted in Words and tagged Imperial Radch, Pixel C, science fiction on February 12, 2017 by Chris. The nominally final chapter, though? Like, the bits and pieces of new world building were cool, and I don’t want to give them up. But the plot was so damn linear. 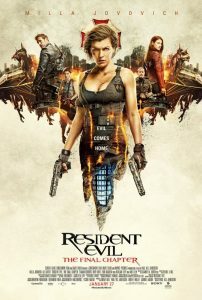 Alice gets in a fight, she gets a mission. She gets in another fight, she moves toward her mission. She gets in another fight, she gets a little closer to her mission. And so on. None of them felt this bland before! I’m sure I’ll give it another chance when it’s time to marathon the whole series, but until then, I’m pretty disappointed in a mediocre capper on such an otherwise reliable sequence. 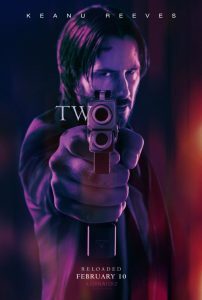 Cool graphic design on the poster though, right? This entry was posted in Film and tagged action, horror on February 9, 2017 by Chris.